As for the Mobile business, Samsung will continue its efforts to differentiate its smartphones by adopting cutting-edge technologies, such as foldable OLED displays. 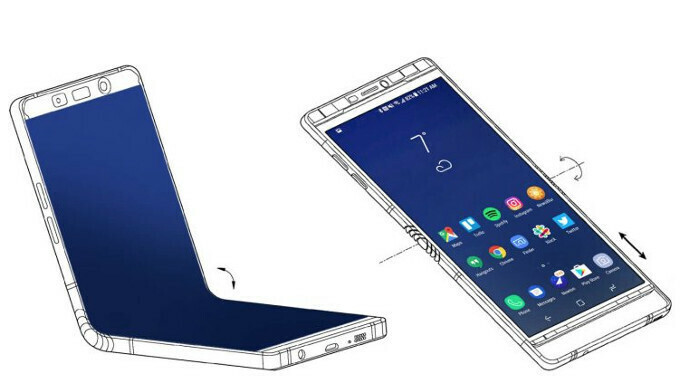 There you have it, Samsung may be prepping for battle this year, as the design of its purported foldable Galaxy X, or Wing, or whatever it names it, is reportedly "almost finished," and it is the interface puzzle that needs polishing now. Samsung allegedly brought both infolding and outfolding prototypes at a secret meeting around the CES expo earlier this month, and its presentation attracted larger than the usual crowd of investors and carrier reps this year, as the product is finally close to retail release, tipped insiders at the time. The agile Galaxy it outs will likely retail the infolding type, keeping the outfolders for a next generation of bendable handsets due to their higher curvature when folded, hence the need for increased durability. If you are wondering what "infolding" means, look no further than Samsung's latest patent on the matter in the slides below. As for the actual screen size when unfurled, the sources confirmed that it will be a 7.3" monster, allowing you to watch videos in relative comfort, then simply snap it shut, and tuck in your pocket without a second thought. Unfolding will reportedly be done at the push of a button, if Samsung's numerous patents on the matter become reality in some shape or form. So the battery is at the bottom.... My guess is the battery capacity would be less than 2,000mah. Now the question remains. Should I get this foldable one than or the non-foldable one? https://www.digitaltrends.com/wearables/samsung-flexible-battery/ Samsung is real tech. company..... Not a fruit seller. With their track record on batteries, I will wait for the second recall. Its your right to settle for less than the best. There can be flexible batteries, or dual batteries inside the phone. No one will buy a phone with 2000 mAh battery. Can't wait. This competition between Apple and Samsung makes it amazing for us users ! Simple fact of life. Without competition there is monopoly . Samsung obviously innovates , no one can take that away but at the same time Apple does too. Both have their strengths . The end user is the beneficiary in this . And Apple blows them away in literally every other aspect of running a consumer electronics organization lol. Sales, customer service, you name it. And Apple has blown them away in sales. So what? With that design, you'd have to unfold this every time you want to use the device. How many times can it be unfolded until it begins to fail? Also, I feel like the no-brainer name for this device should be the Galaxy V instead of Galaxy X.
I'm excited to see it but the foldable phone in pictures above isn't looking good!! I hope they have another ideas for the foldable phone..